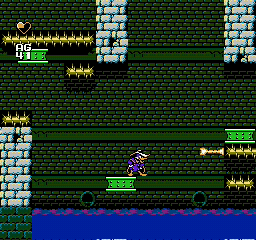 NES Darkwing Duck (USA) in 11:35.15 by Walker Boh. This is the fifth Darkwing Duck movie made, and the second one published. This movie is 58 seconds faster than the previous version by the same author. The game is a basic platformer but thanks to a certain weapon this movie never gets boring. The arrow gun allows the player to climb up walls and use creative shortcuts to optimize all movements so that the absolute shortest route can be taken. In case you are wondering why the player keeps on jumping so much, it is because landing and not jumping again immediately makes the player stop for a short period of time. With constant jumping these landings can be avoided.